Venezuela state oil company Petroleos de Venezuela (PDVSA) was forced to pay $70 million into a London court after its ships were arrested over unpaid ship charters. MIAMI -- Venezeula's state oil company PDVSA has had to pay $70 million after its ships were arrested by a court in London for its failure to pay for its use of 2 ships it contracted for. 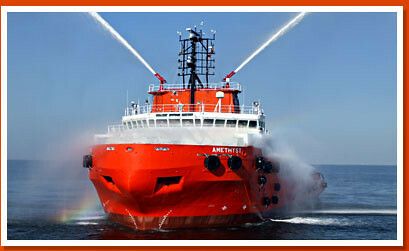 CH Offshore, Ltd., a Singapore-based shipowner, chartered two ships to Petroleos de Venezuela (PDVSA) beginning in 2008. The Amethyst and Turquoise were anchor handling and supply vessels and CH agreed to charter them to PDVSA in 2008 for $50,000 a day each. In 2009, as the financial crisis began to bite and oil and charter rates collapsed, CH agreed to lower the daily rate to just over $40,000 a day for each ship. CH renewed the yearly contract earlier this year but PDVSA had not paid a total of $68,257,203.96, according to court filings in London and Miami. The ship contracts were subject to English maritime law and CH Offshore brought suit under the contracts in London, getting a Mareva injunction to seize PDVSA ships. Court records reveal that PDVSA has yet to file a response in London, but CH released a statement saying that after it arrested the Venezuelan state oil company's ships, PDVSA agreed to pay $70 million. "The Company had arrested vessels belonging to PDV Marina as security for its claim," said CH Offshore's Board Secretary Valerie Tan May Wei. "PDV Marina has made payment of US$70 million into court as security for the Company's claim including interest and costs. Accordingly, the Company has released PDV Marina's vessels." CH did not say how many PDVSA ships were arrested nor where the arrests took place. Simultaneouly, CH filed suit in Florida to find any PDVSA assets in the United States, and garnished $93,108.52 at Wells Fargo Bank belonging to oil service company Astivenca Astilleros De Venezuela, with whom PDVSA has a close relationship and had subleased the ships. CH warned that the litigation may take a year. The lawsuit marks the second default by Venezuela in the last three months, despite $100 a barrel oil prices. In July, Venezuela defaulted on a $100 million bond from state-owned steel company Sidetur, which Venezuela expropriated in 2010. Further large legal judgements loom on the horizon against the beleagured Latin America nation due to a decade of expropriations. In August, the World Bank's International Center for the Settlement of Investment Disputes (ICSID) arbitration panel ruled that Veneuela was liable for a multi-billion dollar expropriation of ConocoPhillips' oil investments in the country. ConocoPhillips, which says it invested $5.3 billion, is seeking $30.3 billion for the expropriated assets. That case is ongoing, as are almost 30 other cases before ICSID. ExxonMobil is also seeking a multi-billion dollar judgement for the expropriation of its assets. Despite high oil prices and having the largest oil reserves in the world, Venezuela's oil production fell during the term of socialist President Hugo Chavez and the country produces less than 3 million barrels a day. By comparison, Saudi Arabia -- which has less reserves than Venezuela -- produces over 10 million barrels per day. The bolivar currency changes hands at 45 bolivars to the dollar in the illegal black market -- 7 times the official government rate of 6.3 bolivars to dollar. Officially, inflation is running at 49.4% with widespread shortages of such basic consumer staples as toilet paper, cooking oil, and corn flour because of the lack of dollars to import the goods.